As shown by the functional block diagrams, the PSW-1211 is very similar to the discontinued model of PSW-1111. 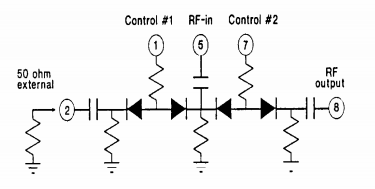 Because of this similarity, with the addition of a 50 ohm resistor at output #1, the PSW-1211 can be used in place of the PSW-1111. With output #1 terminated in 50 ohms, the PSW-1211 may be operated as either an absorptive or a reflective SPST switch. For an absorptive application, both control #1 and #2 must be used. The logic is given in table 1. 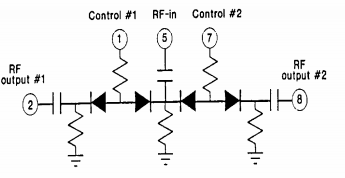 At stage 2, the signal path closes from the input (pin 5) to pin 2 and the signal is absorbed at the 50 ohm termination. For a reflective application, control #1 can be either open or grounded. 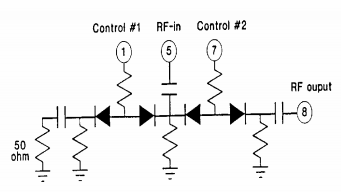 This will cause the signal to reflect back to the input source when control #2 is 0 volt. Our discussion has focused on using the PSW-1211 as a replacement for the PSW-1111 with pin 8 as the output. However, if the PC board layout is such that terminating pin 8 in 50 ohms is more convenient, then this may be done and pin 2 can be used as the output with opposite logic. Please direct any questions or comments on this application note to our Applications Dept.